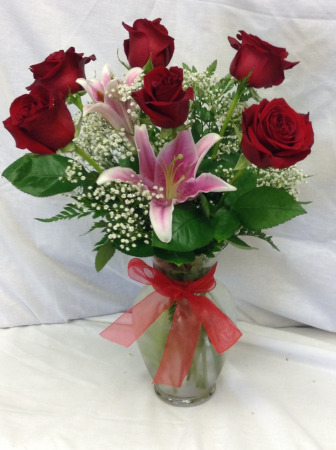 All aglow with botanical beauty and just right for expressing cherished thoughts, this superb arrangement combines the perfect mix of roses, waxflower, myrtle, salal, and a stargazer lily in a graceful ruby vibe vase. 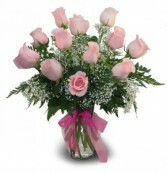 This showy and extra large mix of fresh and beautiful stems will make quite a statement when it arrives. 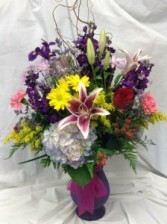 Our designers will use the freshest stems of Roses, Lilies, Stock Hydrangeas and more available to artfully arrange this tall and full arrangement. This one is a show stopper!